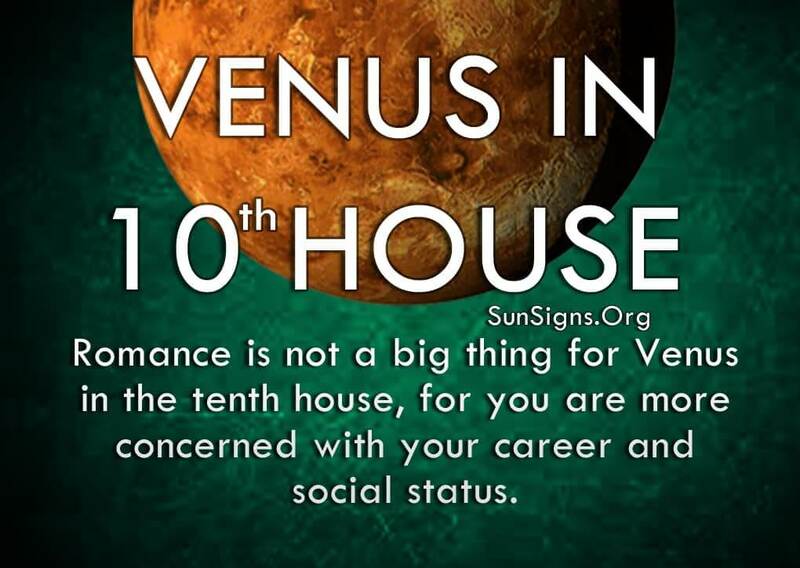 Romance is not a big thing for Venus in the tenth house, for you are more concerned with your career and social status. When you do fall in love, you want someone as serious and devoted as you are. This can be difficult to find with your sometimes high standards. Venus represents pleasure, enjoyment, love, creativity, and beauty. Venus in 10th house is often described as being cold or detached when it comes to feelings, for you rely more on logic than emotions to get things done. Read more about Venus in astrology. The thing you love most in the beginning of adulthood is getting ahead in your career, and you work tirelessly to make that happen. You may have become involved with someone along the way, but you make it perfectly clear that your schedule is loaded with work-related events and projects. Venus in 10th house meaning shows that one thing you look for in a partner is their appreciation of your wealth and material possessions. You enjoy your status and you like to show it off to others to receive their admiration as well. But you despise flashy or gaudy items and gestures. You simply have the best of practical things that enhance your lifestyle. This is also part of your charm and confident manner. You exude a strong personality, and your stamina in bed is incredible. Any partner you choose may have trouble keeping up with you in the bedroom! But you don’t even reach that stage until you know for sure that you want to go the distance with this person. Venus in 10th house astrology also suggests that you tend to take your time in developing a relationship, which is often why you don’t begin a serious commitment until you are well-established in your career. You want to have a solid home and a secure nest egg before starting a family, and your slow and steady pace takes time and effort. And no one can change your mind once you’ve decided on the right path. But be careful that your need for validation doesn’t get in the way of finding that special someone. Not everyone is as concerned with status as you are, so they may not offer as much admiration as you’d like. But find someone with similar interests and the rest will fall into place. Just be aware that you may attract people who only want to be with you for your money, and have no interest in a deep and fulfilling partnership. While Venus in the 10th house long for other people’s adoration, you also want them to be genuinely happy for you and your success. Your loved ones understand this and offer you true praise, but outsiders may not be able to find the balance you’re looking for. First impressions may see you as distant or aloof. But those who stick around to get to know you, will find a trustworthy, solid and caring individual who takes care of your family and your responsibilities. This kind of dependability goes a long way in love. (Capricorn is the ruling zodiac sign). And those who show you the same kind of devotion will get to see your dry wit and charming nature. You didn’t get ahead in life from sheer luck alone. You know how to play the game and you know how to win over your love. This is true of your love life as well, and you have many things to offer a potential partner.